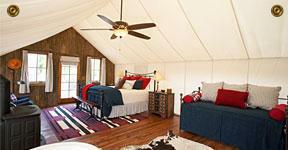 A luxury tent at the Ranch at Rock Creek, Philipsburg Montana. There are hundreds of choices for a ranch vacation in the Great State of Montana. Some are low priced, and some go the luxury route, and others combine a few elements of both and get superb reviews. Other ranches offer the newest form of camping, known as “glamping” which offers ultra luxe beds, linens and fixtures under a canvas tent with plenty of amenities that will make even the slickest city-slicker feel at home. If the idea of camping in luxury appeals to you, there are some great choices in Big Sky Country. At The Ranch at Rock Creek, in Philipsburg MT, the glamping option appeals to both families and couples. The ranch has four large canvas cabins, each 810 square feet, and these family units are separated by a curtain. There are also smaller 630 square foot classic cabins perfect for a romantic couple’s getaway. A couple from Los Angeles shared some of what made Rock Creek’s glamping part of what they most enjoyed. What do people do at The Ranch at Rock Creek? Well, some celebrities like Kate Bosworth get married there. Others perhaps like being able to hide out in the montains, meadows and streams of this lightly populated part of Montana affords. There’s also a stable full of horses, archery, white water rafting, movies in a theater, and of course, just watching the show that happens in Big Sky country every night, stars with no light pollution.